Before we begin, I want to thank our sponsors one more time. You were a HUGE help in this playroom makeover and greatly appreciated. Create Centers: Art, Kitchen, Reading, Baby etc. I can proudly say, I accomplished them all except one…. “displaying Eva’s artwork.” I purchased what I need to display her art, the problem is, I don’t know where to hang it! LOL I’m so scared to hang something if I’m not 100% sure where to put it. I’m still brainstorming and I’d rather sit on it then put unnecessary holes in the wall. It has a great mix of colors! I was on the hunt for one more piece and came across this vintage Chinese checker board. LOVE! It was the perfect shape and it’s the same material as the license plate. Perfecto! You guys! I love this side of the room more than anything! Her little White Wood Desk from Lampsplus, the back, white and red mix. Oh my! The desk is solid and beautiful. It’s simple and matches her room great. She can grow into her desk. Her reading corner really came together too! What do you guys think? The black shelves are the perfect modern touch! The personalized gumball machine [Sweet & Bubbly] is from Minted. The picture of Eva and her dad (black and white) is from Framebridge. The touches of red really make the space! Her little magnet board with some of her cousin’s pictures. Too cute. This big E is perfect for this little reading nook! I had gutters cut for her books. They hold a lot of books and I like that the books face outward. Muchhhhh better! I can’t get over how big this space feels now! Her baby doll area is to the left, kitchen then her dress up area! The open area above the kitchen will be filled soon with an amazing homemade sign! Keep you posted on that, it going to totally COMPLETE the space. Be sure to PIN the image above! Let me know what you think below and thanks for following along on this makeover journey. Head over to the other blogs below to see their rooms. 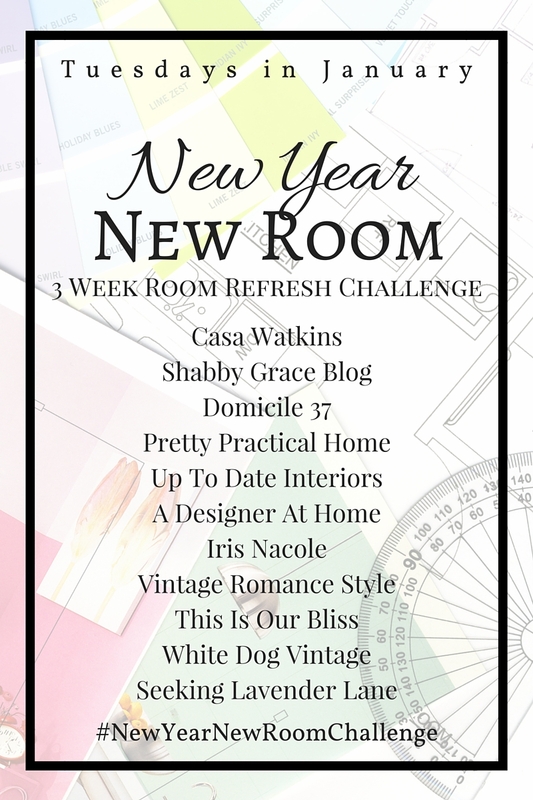 Some blogs are revealing their rooms next Tuesday, oh yah! Be sure to check back next week too! What’s your favorite part of the makeover? oh it’s awesome! we have a chair rail in our dining room i would like to take down but i know there are layers of paint and it will be a real challenge to deal with! i love the more open look without chair rails! Oh man, I hear ya. It’s intimidating to open those kind of “cans of worms.” Thanks for stopping by!!! This is one of the cutest kids spaces I’ve ever seen, and you’ve managed to think of every possible scenario for her to play in, and have it readily available for her too! I love it! Awww thank you Iris!!! That’s too kind of you! Thanks for stopping by! Looking forward to seeing your reveal, heading there now! I can’t get over how creative you are and how every area was thought out to use the space completely! Great job Chick. Eva should have a great time playing and making memories. Thank you Mom!!! I wanted to use the whole space and create areas that she will use! oh my, I LOVE the room color and color palette you chose to go with in terms of the whole room. the red accents pop against the wall. This is definitely a space Miss Eva can certainly grow into. Thank you SO much!!!! The red against the gray, I love too!!! So fun!! I love this Sara!I can’t wait until we can make a room a dedicated playroom for our boys again. I love all the artwork especially. Great job mama! Thanks Sydney! It really was a fun room to design!! WHAT A TRANSFORMATION!!! Yes, I love it. Great art work and the space looks so much more open too. You have inspired me to tackle my own play room……someday lol. Thank you so much Steph!!! LOL, you’ll tackle it one day! Love it! It looks so much better with the brown gone AND the chair railing. The color is so fresh and bright. You did a great job. I also love your use of color groupings! Perfect! Thank you so much Linda! I’m so glad we removed the chair railing! I love it, Sara! I bet your little one loves her new space! I love how bright the room looks. Can’t wait to see what artwork you place in that spot :). My favorite part is the reading nook! The whole room is awesome but the nook looks so cozy! Thank you Deb! I think the reading nook wins for everyone’s favorite part! I appreciate you stopping by and reading my blog! This is a dramatic before and after! I love the neutral wall color with the pops of color, beautifully done!! Wow Sara! Great beautiful space! I love the gallery wall you created and that rug : ) My kids would love a play space like this…so pretty! Thanks Deb! Yes, the rug really makes a statement! I’m really happy with how it all came together! Thanks for stopping by! This looks amazing!!!! I love how bright and fresh it feels. Love the pops of black and white, it makes it feel so modern. Beautiful! Thanks!!! We are loving it too!! Ohmygoodness this is beautiful! So, so beautiful! What a dream play space. And that gallery wall is so cute. I love the different elements and the mix of items. Thank you SO much!!! I couldn’t be happier with this makeover! Looks wonderful! Perfect hang-out for the kiddos for sure! Thank you so much Vel! We are really enjoying this new space! Thanks for stopping by! Sara–love it all!!! It doesn’t even look like the same room and I know little Eva must love playing in there. The gallery wall looks so great and the vintage Chinese checker board is awesome! The reading nook is just perfect and I know you must be thrilled with how it all turned out. Great job! What a change!! It is so fresh, bright, and colorful. What a fun space to play in. Can’t wait to see the art up next week. This looks so good! The gray paint is absolutely perfect. I can’t believe how much bigger and more modern it makes the room feel. Love the different “zones” in the room, too. Super fun and functional space! It looks great! love how bright and happy it is!! Thanks Susan!! We love our new bright space! Thanks for stopping by! Sara! This looks incredible!!! I seriously love everything about it. What color did you use on the walls? Thanks so much Erin! It’s repose gray by Sherwin Williams! I love it! What paint did you use? The gray looks perfect. Fabulous playroom! The difference is amazing. LOVE what you have done.